This lesson is the first step to understanding how interiors affect us. It will examine how different entries can siphon away or stifle luck and opportunity. The size of the entrance door is also important. The door size should be in balance with the house size. A relatively narrow or short door is similar to a small mouth or constricted windpipe and will not “inhale” enough good ch’i to circulate, thus diminishing occupants’ opportunities for good health, wealth, and good fortune. When I look at a home or business, I am stepping into my client’s shoes, seeing how their surroundings are affecting them. I am looking at how structure influences the circulation of ch’i within a home. Ch’i flow, ideally, should be smooth: not too fast and not too slow. Doors and windows are valves within a home that pump ch’i throughout the space. In fact the entry door is known as the “opening” or “mouth” of ch’i. Not surprisingly, one of the first areas I consider is the entrance. The entrance is our first impression and experience of our home or workplace. Both the entrance door and the entry foyer should be gracious and to scale to allow ch’i to enter in a smooth, balanced flow. Sometimes it’s amazing to me how the patterns of our life can mimic the layout of our homes. One client was a New York investment banker who had lost his job and remained unemployed after more than three years of interviews and fruitless job searches. Out of desperation, his wife called me and sent me drawings and photographs of their two-bedroom apartment. They resolved the career-constricting entrance by installing a large framed mirror opposite the entrance and within months, the husband had a breakthrough in his formerly dead-end job search and was happily employed. The mirror served to symbolically open up the career areas as well as to visually widen a narrow entry and therefore open up the home — and the occupants — to good fortune. The ideal entrance to a home should be spacious and well lit, welcoming you into the home. As the opening of ch’i, the entry should usher you in and encourage your ch’i to rise and flow smoothly. The entrance door should open up into the widest area of the foyer allowing you the most spacious view of your home. If your door opens to the narrowest area, it will cramp your ch’i and stifle your luck, causing physical stress and mental anxiety. To “cure” this luck-cramping door, either change the hinges so the door opens up to the widest area or hang a mirror on the adjacent wall to reflect the wider area of the foyer. Narrow, constrained, or dark entrances oppress our ch’i and can choke our luck, causing life to be a struggle. If, for example, you enter into a long, narrow hall, you may suffer from health problems, such as respiratory difficulties or difficult births. A dark, narrow entry can depress you, causing dark thoughts, moroseness, or melancholy. 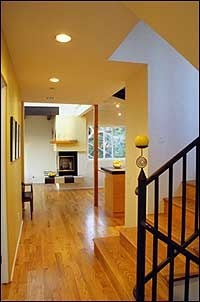 We can cure the dark entry with a bright ceiling light, and a mirror on the wall can counteract a narrow entry. You can cure a proportionately small entrance door by hanging a mirror above or on both sides of the door to give the effect of a taller and wider entrance. Stairs that descend directly toward the entrance door are also avoided. A Western architect working on a residential development project in Hong Kong found that the developers nixed his design for a maisonette where the stairs aimed toward the entrance. The developer explained that their home-buyers would anticipate that money would roll down the stairs and out the front door. After the architect reworked the direction of the staircase, his design became highly marketable. When Chinese people living in the West are house shopping, they often avoid center-hall colonial-style houses. If the front door directly faces the back door, they believe that when ch’i enters, it flows too quickly and exits without properly circulating throughout the home. As a result, occupants may have money and opportunities come their way, but they will not be able to hold on to and take advantage of them: they will lose both the money and the opportunities. For example, a young newly married couple moved into a charming 200-year-old farmhouse and found that both his and her businesses foundered. While they both poured a great deal of time and energy into their enterprises, they were not reaping profits. One feng shui reason was the classic front door-backdoor alignment of this center-hall home: money, business, and opportunity entered, but the couple could not grasp them. There are numerous ways to cure the front door-backdoor problem. A crystal, a mobile, a wind chime, or a chandelier might be hung in the line between the entrance and the backdoor. Or in a large foyer, a plant, fountain, or flower arrangement can be helpful in circulating energy and opportunity with a home. The stairs on the left are in a bad position — they allow the ch’i to roll right out the door. The stairs in the middle have the same problem, but they have a wind chime placed in the entrance to redirect the ch’i. The stairs on the right allow for good flow of ch’i. Traditionally, the entrance to a Chinese building often was a doorless opening where visitors stepped over a threshold that rose several inches off the ground. The superstitious reason behind this high stoop was that it would trip up devils. In fact it kept water out during the rainy season and dirt out during dry spells. Once inside, visitors faced an ornate “spirit screen” that was supposed to stop devils and ghosts in their tracks. In fact, the screen shielded the interior from winds. If your house has a stairway that aims at the front door, hang a crystal or a wind chime between the lowest step and the front door to hold in wealth and recirculate ch’i. If you don’t enter into a foyer, but directly into a living room, and the view is balanced, this will have a relaxing effect. Many of us don’t use our front doors to enter our homes; we enter through a garage door, or a side door. The rules of good entrances still apply. This entrance still should be well lit, reasonably spacious, and with a balanced view. Cures are discussed on pages 21-25 of Interior Design with Feng Shui. We have seen a number of ways to make a good entrance out of a bad one. Another important consideration when analyzing the entry to your home is whether it is harmonious or unbalanced. If you enter and have a partial view, this potentially can unhinge your life. For instance, if on entering, one of your eyes can see into the distance and the other eye is arrested by a wall, this can be either physically or emotionally unbalancing. If the obstructive wall is on the right side, when you enter, you may feel emotionally unbalanced and constantly enter into quarrels with loved ones. According to Master Lin Yun, these imbalances can lead to divorce within three years if not cured. He explains that if spouses return home every day to this emotionally unbalancing entrance, they will continually bicker until the bickering turns into full-scale marital war. Spend some time looking at the entrance to your own home. Is it spacious enough or do you need to hang a picture or mirror to create a sense of depth? Does the ch’i flow too quickly or too slowly? What cures would/will you apply to the entrance based on what you’ve learned so far? Think about entrances of other homes that make you feel welcome and relaxed. What elements of those entrances create that effect? If you’d like to spend more time on this assignment and broaden your understanding of the power of entrances, look through some books you’ve got at home with pictures of home entrances. Note your reaction to each and what changes you would make, if any, to those entrances. What are some elements that create consistently good responses in you? I loved the way you dealt with the entrance topic, but I didn’t see my specific problem! My front door opens up onto a blank wall, (painted pale yellow) I have hung 2 prints here, in summer they are of Japanese countryside in Winter, & in Winter, they are of sunny, Mediterranean vistas, with lots of lovely blue waters showing. (and houses, yachts etc) . One then turns left & faces the main living room. On the right is a doorway which leads in to the small dining room, then onto the small kitchen. On the left is where I actually have my dining table (round) next to the main windows in this area, In summer, this gets really really hot, so the venetian blinds are closed tight to keep the place feeling cool, In Winter, however, the reverse is true, it’s very cold in the room, so as soon as the sun comes round onto the window, I open the blinds, then close them down again at sundown. Would you say the prints are enough to counteract the door opening onto the wall? Or do you think I should put a small mirror there, maybe replacing one of the prints? I live in rented premises, so am a bit limited by this, but try my best to get the Feng Shui right. In saying this, my partner hasn’t worked for 3 years, except seasonally, he really needs to find a job he can cope with, having some injuries, due to a lifetime of heavy lifting. Also our finances aren’t the best, as I am a pensioner (old age! ), and even though I try to sell my unwanted stuff (clutter!) at a car boot sale. I don’t make much money. Can fixing the doorway problem help with our finances & a job for my partner? it seems you have a warm, serene understanding of your environment needs. the prints sound like a beautiful choice but i’d say that a mirror tucked in that area somewhere would improve your chi flow. i also have two concerns about my entrance door. i will be moving to an apartment and my main door faces my neighbor’s main door too. secondly, as i open my main door it faces a wall (though its a decorative wall). what cures can i do for a good fengshui? Thanks so much, will try to buy a small decorative one on the week-end, and swap it with one of the prints. Many thanks annemiecke. I will try this, I think I will try to buy a small mirror & hang it up in place of one of the prints, although I’m thinking, wouldn’t that reflect the chi back outside, through the front door, which, especially in our hot Summer, is open 24/7? I have a small bagua mirror on the wall just outside the front door, as I have a straight driveway directly in front of my Villa, to deflect bad chi away. This is ok, isn’t it? Is it okay if the two bedroom doors that are facing each other are aligned? i need your honest answer.. There are so many choices out there that I’m completely overwhelmed .. Any tips? Cheers! I’ve used blogspot and prefer wordpress by far. don’t bother with the paid version. you can comfortably use the free version. Still, the posts are too brief for novices. May just you please prolong them a bit from subsequent time?